Angela Merkel has called for a return to Europe’s Schengen system of open borders as soon as possible. The German chancellor said the pictures of desperate migrants trying to reach western Europe via the Balkans showed the urgency of next Monday’s EU summit. It comes as one by one, countries have been closing their borders or restricting access to refugees – with the domino effect putting enormous pressure on Greece to the south. 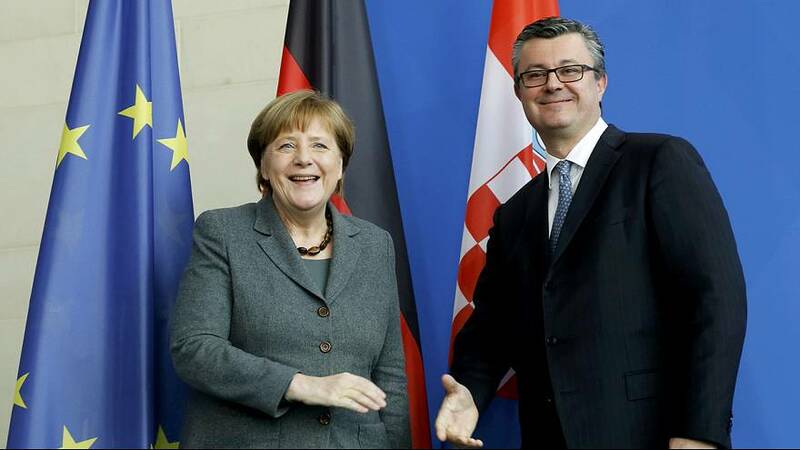 “I made clear again that Germany supports what we agreed on at the last EU summit on February 18, that we want to reinstate Schengen,” said Merkel, after meeting the Croatian Prime Minister Tihomir Oreskovic in Berlin. Under EU law, the member state responsible for examining an asylum seeker’s claim is usually supposed to be the state through which the person first entered the bloc. However under the influx of migrants the system is widely accepted to have failed. Austria – which has limited the number of migrants it lets through to 3,200 a day, and the number of asylum applications it accepts to 80 – has stuck to its position. Croatia, also on the migrants’ route northwards, has said it might deploy its armed forces to help police control flows. Border restrictions imposed by the Former Yugoslav Republic of Macedonia (FYROM) – not an EU member – have also added to the pressure on Greece, which risks being inundated. The number of refugees arriving on its shores has increased more than twenty-fold in a year – from 5,000 in the first two months of 2015 to an estimated 120,000 since January 1st this year. Chllr #Merkel: Situation at the Greek border shows, that decisions of all 28 (EU members) are necessary. Unilateral measures are of no help. Well, Mrs. #Merkel – you created it. Hardly fair to let #EU pay for your nonsense. Mrs #Merkel said that she would not back down on #refugees “I want to keep Europe together and show humanity”. She is my hero. Many refugees have since moved on to other countries, but the United Nations High Commissioner for Refugees (UNHCR) called for better planning and accommodation for at least 24,000 it said were stuck in Greece, including 8,500 at Idomeni on the Macedonian border. “Europe is on the cusp of a largely self-induced humanitarian crisis,” the UN refugee agency spokesman Adrian Edwards said. Another senior UN official also issued a stark warning. “Either we have massive orderly relocation, either we will have a repeat of what we have seen last year with fragmentation of the routes in the Western Balkan possibly going to Bulgaria directly from Greece to Italy or going to Albania. We would like to see that orderly and that’s why we think we should not shut down the relocation scheme just because the results are not yet there. Countries have to wake up, there is no other plan,” said Vincent Cochetel, UNHCR Coordinator for the Refugee Crisis in Europe. Despite the talk of the need for a Europe-wide solution, countries are accused of failing to act on their words. The UN’s Special Representative for Migration, Peter Sutherland, has said as things stand, Greece risks becoming a vast concentration camp for refugees. Angela Merkel said this week in a TV interview that the EU did not fight to keep Greece in the eurozone last year, just for it to be “plunged into chaos” now.